Four talented young musicians from Palestine visited the UK to study for two weeks and take part in a public performance. This is part of the Choir of London Bursary Scheme which has been running for several years and supported by the British Council since 2012. Its aim is to give Palestinian musicians between the ages of 12 and 18 an opportunity to soak up musical life in the UK. This year, students attended a residential orchestral course in Suffolk and participated in classes, rehearsals and workshops at the Royal Academy of Music in London and then performed in a concert themselves. “I cannot really find the best words to describe what I experienced. It would take years to explain the way I felt during my stay in London. “The Palestinian group spent its first week with the Pro Chorda Chamber Orchestra. I had the chance to meet and play with amazing teen musicians and be trained by incredible teachers. Together we played games, sang and played music and we made friendships that will last forever. I also had the chance to taste fish and chips and baked beans! 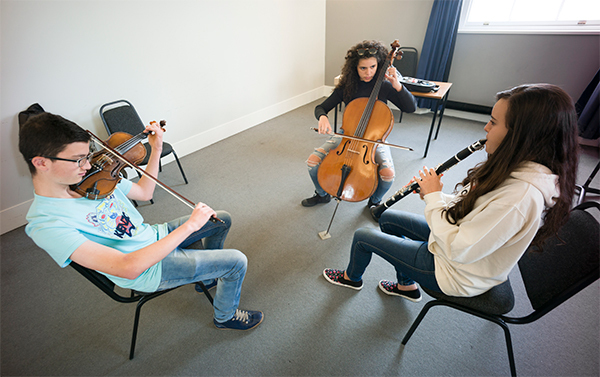 The young musicians practicing at the Royal Academy of Music in London. Photo: Nick Rutter. “There was also time for some serious political discussions concerning the Palestinian issue. Our opinions were met with complete understanding. “We spent our second week in a place where I have always wanted to study, which is The Royal Academy of Music. I learned a lot and improved my skills after being part of workshops and masterclasses with the teachers I met there. It was also a pleasure to play British music with British musicians! In addition, we went to the Royal Albert Hall to hear the Mahler Chamber Orchestra at the BBC Proms, which was one of the best concerts I have ever seen. “It was also the first time I’ve celebrated my birthday away from family and friends. However, in London, I found my second family and many honest friends and teachers, who celebrated my birthday with me, and I was never alone. It was not like any of my past birthday celebrations! It was simply special. Most of all, I was speechless when our teachers and audience who attended our final concert surprised me and sang Happy Birthday! Read Jude's blog; Jude also took part in this year's bursary scheme. Read more about the Choir of London Bursary scheme, and the students taking part, on the Choir of London website.